With its riverside setting, your hotel is just a few minutes’ river taxi ride across from all the main city sights. 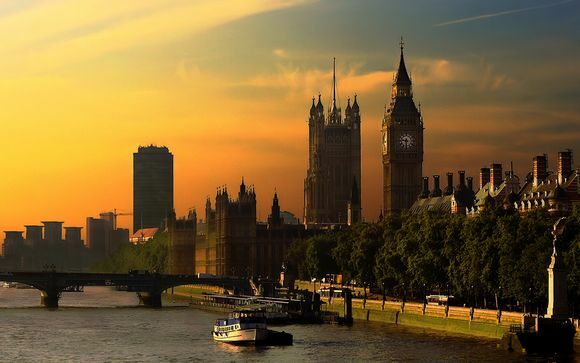 Visit iconic landmarks such as the British Museum, National Gallery, Tate Modern, Royal Opera House and the Barbican Centre just to name a few! If world class restaurants, cobbled streets and all the best shows in the West End appeal, then head for Covent Garden. Explore London by district, taking a different area each day to get under the capital's skin. Discover chic Notting Hill and Kensington, establishment Chelsea, quirky Camden Town and Regent's Park, the resurgent Docklands, genteel Hampstead and Highgate, naval Greenwich and villagey Stoke Newington. You can choose between tickets to the Cruise or Travel Show on Saturday 9th January 2016. But whichever ticket you choose you will stil have access to both events and the iconic London Boat Show! Begin your own journey of discovery at the London Boat Show. 2016 is the Show's 62nd year of hosting our much-loved and internationally renowned Boat Show in the capital. Enjoy world famous brands and the best of British, as well as many international manufacturers and industry experts who are all on hand to make your visit a fantastic. The Telegraph Cruise Show in association with Dubai & Emirates will bring together over 50 of the top cruise lines, free advice and guidance from cruise experts, and amazing deals, discounts and competitions. The Telegraph Travel Show in association with Dubai & Emirates is dedicated to making your travel dreams a reality. Whether you prefer relaxing on the shores of a sandy beach or exploring the bustling back streets of a metropolitan city, immerse yourself in the best cultural experiences and holiday ideas from every corner of the globe. Go beyond the brochure and delve deeper into the world’s most popular destinations with over 200 exhibitors, including; Abercrombie & Kent, the Tourism Authority of Thailand, Yellow Zebra Safaris, HF Holidays and the Bahamas Tourist Board. 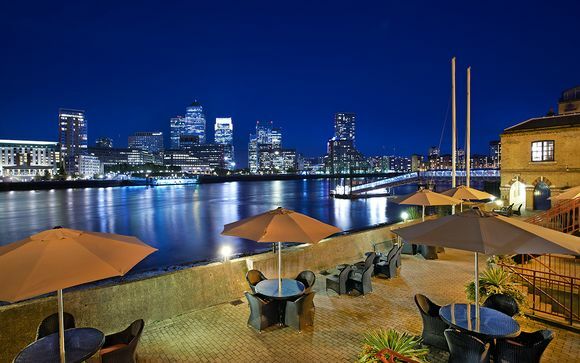 Welcome to the DoubleTree by Hilton Hotel London - Docklands Riverside, located along the River Thames with stunning views of Canary Wharf – perfect for travellers looking to make the most out of London. This former 17th century Wharf Building boasts exposed brickwork and London’s last dry dock for shipbuilding. The hotel’s complimentary ferry provides access to Canary Wharf and a connection to the Thames Clippers for an unforgettable voyage into central London. You deserve to unwind in style and comfort. Hilton London Docklands Riverside offers a convenient retreat where you can relax after a busy day out sightseeing in the capital. Providing a mix of elegant dining, comfortable accommodation and leisure amenities, the hotel is large enough to provide all the mod-cons you expect, along with a warm and welcoming atmosphere. This offer is based on a Double or Twin Room. Indulge yourself in this spacious room with a separate desk area. 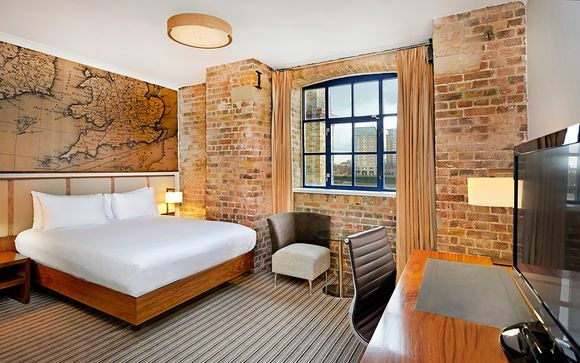 The exposed brickwork exudes contemporary style while the antique map and padded bed pay tribute to England's nautical past. Old and new, sitting side-by-side, to create a distinctive flare. The newly refurbished restaurant and bar, 'Columbia', is located in the Grade 1 Listed Columbia Wharf and offers seasonal produce and international variety. For private dining and exceptional experiences this would be the perfect choice to end your day. Enjoy the international breakfast, all day dining, live cooking and cocktails while overlooking Canary Wharf and The Thames. Terrace Restaurant - See the city laid out before you from the alfresco terrace of this London bar. Enjoy a relaxing glass of wine by the Thames as you watch the world go by. Inside, this sleek modern bar has a plasma screen with the latest news and sport. Guests seeking a tranquil respite will enjoy this bar, which can accommodate 30 guests. Enjoy a cup of coffee in total comfort next to the fireplace or book a private dining experience for friends and family. Lounge Bar - The River Thames and Canary Wharf are the backdrop to dining here. Boats and liners sail by as guests try classic international cuisine or a slice of British fare. This London restaurant's traditional decor and daily menu are firm favourites. Enjoy selections from the Columbia restaurant menu in this stylish space, ideal for intimate gatherings of up to 14 guests. Savour the light bites, bar snacks, Pimm’s and your favorite cocktails. Transfers: This offer includes Thames Clippers Hop-on Hop-off tickets which act as a transfer between the hotel and the event. By river: Daily river taxi service connecting Canary Wharf to various London Piers, including The O2. By rail: The closest station is Canada Water which offers both an underground (Jubilee Line) and overground option, for trains to London Bridge (underground) and New Cross, Crystal Palace, West Croydon or Highbury & Islington (overground).